This Blue Rooster Dragonfly Style Chiminea features solid non-rusting cast aluminum construction ensuring years of worry free use with very little maintenance, beautiful gold accent finish with an image of a dragonfly and fern cast in fine detail, durable steel and stainless steel hardware, convenient carry handles, safe single opening design, hinged mouth spark screen, decorative removable rain lid, traditional 180 degree view of the fire which ensures proper drafting, cast iron grill grate and removable neck for grilling, cast iron wood grate to support the fire, spark arrester neck insert, and propane gas conversion with a deluxe seven piece ceramic log set. Gas Conversion kit includes fireplace granules, manual control for low/high adjustment, ten foot hose, high grade fire ring insert. Logs range in size from 5. 5 - 8. 5 inches. 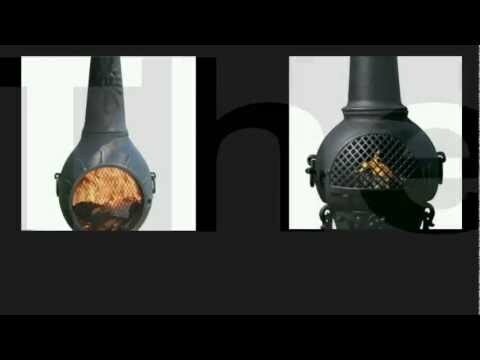 This large chiminea can be converted to a wood burning fireplace by removing the gas components and converted back to gas again by simple installation. Gas chimineas are not recommended for outdoor cooking.